To blend a passion for and understanding of art with the practical concerns of our clients. To connect corporations, health-care organizations, professional service firms, government agencies, nonprofits and discerning private clients with art that nurtures the soul and enriches their lives. In the collections we assemble, we seek art that engages the viewer. Whether the art is soothing, enlightening, thought-provoking or informative, collections with breadth and depth are the hallmarks of our work. We develop each art program to meet the specific corporate personality of the firm. We have implemented historical and regional art programs. Other clients prefer international art, ethnic art or artifacts that reinforce a focus on a particular field. 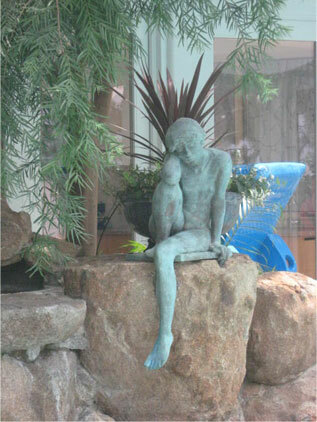 We provide art in all mediums, including photography, video, site-specific sculpture, paintings and original graphics. For example, a San Francisco financial firm wanted to define itself by its location and history. The initial collection was primarily antique views of the city. We expanded the collection to include vintage and contemporary photographs and contemporary fine art paintings relating to the sea, the Bay and San Francisco. To address the firm’s business, we created a collection consisting of antique United States currency plus ethnic artifacts used as currency in foreign countries. Finally, we commissioned several artworks. One is a 4-by-12-foot collage of photographs by Richard Ross of bank notes, stocks and currency from around the world. A wall-mounted glass sculpture by internationally acclaimed contemporary artist William Carlson reflects upon the sailors and dockworkers, an integral part of San Francisco commerce. Our continued success with health-care communities is based on our sensitivity to the special requirements in this area. Our diverse fine art programs address the special needs of an anxious patient awaiting diagnosis, a child confined to a hospital room or a staff member. For example, a cancer treatment center requires beautiful, soothing and uplifting art. For a pediatric center, interactive installations that can take a child’s mind away from upcoming procedures are preferable. A Mickey Mouse figure may be welcoming to a 4-year-old but inappropriate for a teenager. We understand all these considerations. For our private clients, life without art would be unthinkable. We help them locate artwork they love, whether it is in galleries, artists’ studios, auction houses, ateliers or art fairs that they can attend with VIP status. We assist our clients with all aspects of collection management. Our services include framing, installation, appraisals, database management and ongoing care and maintenance programs.